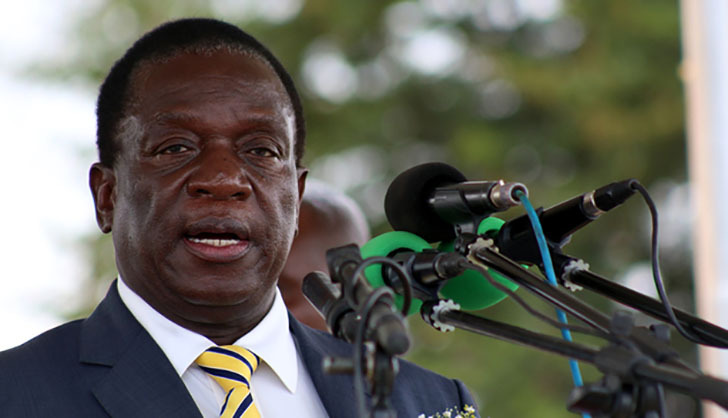 Zimbabwe is on an inexorable and unstoppable economic and political trajectory that will definitely lead to prosperity, President Emmerson Mnangagwa has said. The country, he said, is like a train that has left the station and those that have taken the chance to board will likely reap huge rewards. He also called on the United States government to remove "illegal, spiteful and completely unjustified sanctions on our country, which continue to violate basic human rights of our people". Addressing thousands of mourners yesterday at the National Heroes Acre during the burial of national hero Brigadier-General Emilio Munemo, the President said his administration will continue to deepen sound economic and political reforms to complement the ongoing engagement and re-engagement drive. Brig-Gen Munemo died on Sunday last week after a short illness. In his eulogy, President Mnangagwa said: "Zimbabwe is a train on the move. We cannot be derailed, we cannot be stopped. Let us march forward ever, backward never. Victory is certain, our prosperity is inevitable." The war of liberation that culminated in an independent Zimbabwe in 1980, he added, was waged to restore peace by revolutionaries who believed in peace; and, therefore, it was unconscionable that the country could "pose any type of threat, to any country in the world". "…I am aware that as I make this exhortation, the American government has renewed sanctions against us. "We call for the unconditional removal of the illegal, spiteful and completely unjustified sanctions on our country which continue to violate basic human rights of our people. "We fought for peace, we believe in peace and we do not pose any type of threat, to any country in the world." He emphasised the need to determinedly continue on the path of reform and economic development that was meant to modernise and industrialise the country within the next 11 years. There was need to continue increasing production in order to guarantee a prosperous future, he said. President Mnangagwa said: "As it was during the days of the liberation struggle, many discouragements and misfortunes will befall us. "Back then we remained focused on our task to liberate our motherland. "Today, let us not be deterred from the course we have begun. Our economic and political reforms must continue in earnest; the engagement and re-engagement we seek with those who open their door to us must carry on with greater impetus. "Furthermore, let us increase our productivity and exports across all sectors, improve infrastructure to attract trade and investment as well as broaden our tourism products to grow that sector." He reiterated his commitment to dialogue to move the country forward as the Second Republic was an egalitarian society. "As a listening President, I launched the Presidential Advisory Council on Thursday 7 March 2019. This, along with other ongoing initiatives, reflects my Government's commitment to collective, consultative and participatory governance. "No-one is more or less important, bigger or smaller in the rebuilding of our great country. My doors remain open for dialogue with all our people, for whatever reason," he said. Zimbabweans, the President added, had to emulate the late Brig-Gen Munemo, who he described as an "exceptional researcher", through pursuing research in their various fields, which he said was key to transforming the country into an upper middle-income economy by 2030. "Equally, I challenge researchers to be catalysts in our quest to modernise and industrialise our economy, both in rural and urban areas." Brig-Gen Munemo was also described as a distinguished cadre of the liberation struggle, teacher par excellence, mobiliser and a reservoir of knowledge on the values of the liberation war. "It is that rich record which has earned him a place in our hearts and informed our decision to lay him to rest at this shrine of honour, the National Heroes Acre, alongside many other revolutionaries gone before him. "As much as it is hard to console his bereaved family, let us all take pride in the great deeds which the late Munemo accomplished in the service of his people and nation; deeds that will outline his life on this earth and will inspire generations to come," explained the President. Brig-Gen Munemo was born on 25 November 1995 in the then-Chibi (Chivi) District of Fort Victoria (Masvingo). He went to Fletcher High School in the early 1970s, after which he briefly joined the teaching service between 1974 and 1976. In mid-1976, he joined Hippo Valley Estates as a clerk for a short period before crossing the border into Mozambique to join the liberation struggle in early 1977. His teaching experience was of great use to Zanu, which at that time grappled with thousands of child refugees housed at Xai-Xai Transit Camp. The party deployed the late Brig-Gen Munemo to open a school at the camp for the children. He successfully established the school, which was finally relocated to Tete in 1978. Apart from teaching, the late national hero undertook various duties, including administration and research, in the Culture Section of the Department of Education, which was headed by Dr Dzingai Mutumbuka at Matenje Base. After his military training at Tembwe in 1979, Bri-Gen Munemo was deployed in Gaza Province later that year. Together with other cadres, he faced, fought and survived the many challenges which came with mounting operations in Gaza Province. They braved armed units of the South Africa apartheid regime which had been deployed in Rhodesia. At independence, Brig-Gen Munemo was attested into the Zimbabwe National Army as Lieutenant-Colonel and rose through the ranks. The late Brigadier-General held many posts in the military, including at the Zimbabwe Staff College, the Public Relations Directorate and the Civil-Military Directorate, which he helped set up and initially led as its director in 2003 and then later as the Director-General in 2010. The late Brigadier-General received numerous awards during his military career. The burial was also attended by Vice President Dr Constantino Chiwenga, Chief of the South African Army Lieutenant-General Lindile Yam, Zanu-PF members from various organs, ministers, service chiefs and members of the diplomatic community.